The Lorraine Hansberry Papers chronicle the life of the award-winning playwright and document her legacy, which was largely amassed and constructed by her late former husband, Robert Nemiroff, and his third wife, Jewell Handy Gresham-Nemiroff. The papers include virtually all of Hansberry’s writings, autobiographical materials, journals, diaries, personal and professional correspondence, and related materials generated by Nemiroff and Gresham-Nemiroff as the executors of the Lorraine Hansberry Estate. The Lorraine Hansberry Papers are located in the Manuscripts, Archives, and Rare Books Division of the Schomburg Center for Research in Black Culture. The papers are organized into four series, Personal Papers, Writings, Professional, and Legacy. The collection also includes photographs, films and videos, and other audio materials. If you would like to know more about the specific materials in the collection, please go to the online finding aid. You may access and research the Lorraine Hansberry Papers in person by appointment. 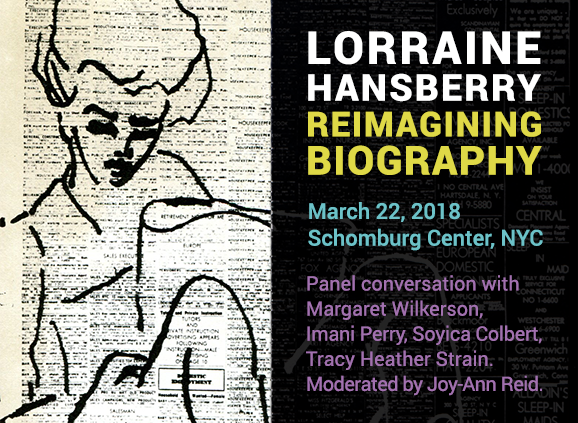 Lorraine Hansberry: Reimagining Biography will be introduced by Joi Gresham, the executive director of the Lorraine Hansberry Literary Trust, and moderated by Joy-Ann Reid (national correspondent, MSNBC). Panelists include Margaret Wilkerson (author of forthcoming Lorraine Hansberry: Am I a Revolutionary? and Professor Emerita of African Diaspora Studies and Theater, Dance, and Performance Studies at the University of California, Berkeley); Imani Perry (author of the forthcoming Looking for Lorraine: The Radiant and Radical Life of Lorraine Hansberry and a professor of African American Studies at Princeton University); Soyica Colbert (author of the forthcoming Lorraine Hansberry: Artist/Activist and professor of African American Studies and Theater & Performance Studies at Georgetown University); and Tracy Heather Strain, (director of Lorraine Hansberry: Sighted Eyes | Feeling Heart, PBS national broadcast January 2018). Pen & ink drawing on newspaper drawn by Lorraine Hansberry. In 1948, Lorraine enrolled at the University of Wisconsin, Madison, where she took art classes. During the summer of 1949 she studied painting at the University of Guadalajara art workshop in Ajijic, Mexico and during the summer of 1950 she studied art at Roosevelt University in Chicago, Illinois.